Crock-Pots, or slow cookers as they are also called, allow you to slowly cook food for anywhere from three to 12 hours. The slow-cooking method usually results in food that is tender and moist. Along with cooking, Crock-pots can keep cooked food warm until you are ready to eat it. 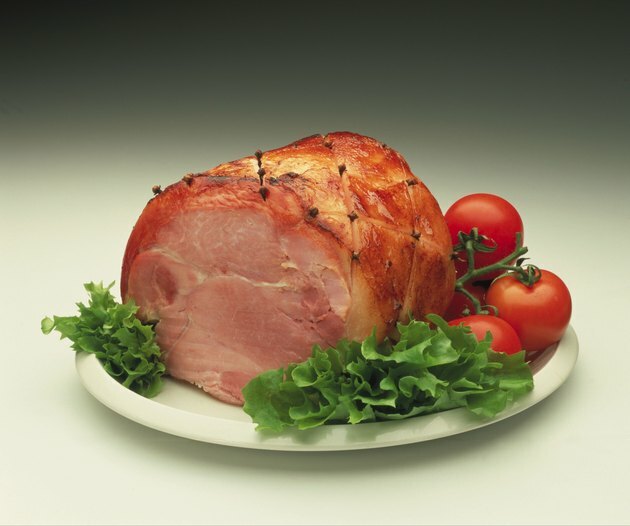 Cooked meats, like ham, must be kept at a temperature of at least 145 F for safety until refrigerated. Cook your ham to an internal temperature of 145 F, as measured with a meat thermometer. Turn your Crock-Pot on, and set it to "warm". Most slow cookers have settings of low, high and warm; low and high are used to cook food, whereas warm is utilized to keep cooked food at the proper temperature. Transfer the ham to the Crock-Pot. It is best to place the ham in the Crock-Pot as soon as possible after it is finished cooking to ensure that the internal temperature does not drop below 145 F.
Place the lid on the Crock-Pot. Keep the lid on the slow cooker as much as possible while the ham is in it to prevent the internal temperature from dropping. Keep the ham in the covered Crock-Pot until you are ready to serve it. Check on the ham every once in a while to make sure that it is not drying out. You may add broth or a small amount of water to the Crock-Pot to help keep the ham moist.